Lite Brite Pegs Modern 7/8" - 8 Colors - LOT OF 200. Good used condition. 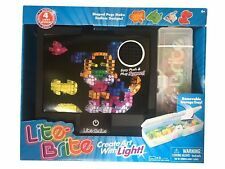 Lite-Brite Magic Screen Toy - Retro Style. Condition is New. Shipped with USPS Parcel Select Ground. Sharing the magical experience you had with Lite Brite with the newer generation is more fun & rewarding as ever with the newly updated Lite Brite! Easy and fun for anyone of all ages. Follow the pre-designed pattern or create your own bright & colorful masterpieces, the possibilities are endless! Trending at $18.87eBay determines this price through a machine learned model of the product's sale prices within the last 90 days. Lot of 175. 7 colors no clear 25 of each color no clear. Note: These do NOT fit the "Magic Screen" Machines. Lot includes 200 regular pegs. One of the great toys ever made.LITE BRITE! There are many many unused sheets, and an abundance of light pegs. As you can see in the pictures, it does light up and work properly. More vibrant than modern pegs. Vintage 1970's Lite-Brite Peg Refill Kit Hasbro. Condition is nice . Lot of 200. I take a lot of pictures because picture are worth a thousands words. 900 classicL it e Br it e Pe gs. Te n different assorted colors in t he b ag. T he b ag o fp egsw ei gh s just overo ne p ou nd. Hasbro LITE BRITE Cube - Includes Colored Pegs 4-Sided Play - NO SHEETS. Condition is Used. Shipped with USPS Priority Mail. New ListingLITE BRITE, Hasbro Flat Screen Toy, Purple! Excellent Condition! 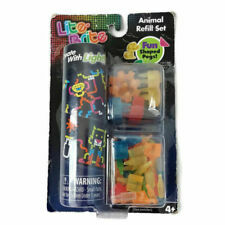 Great game lots of fun ...free batteries included...only 3 imprints left..
Lite Brite Pegs Modern 7/8" - 6 Colors - LOT OF 100. These do fit the "Magic Brite Screen". 1973 Vintage Hasbro LITE BRITE - Working With Original Pegs. 1973 Vintage Hasbro LITE BRITE - Working With Original Pegs.. Condition is Used. Shipped with USPS Priority Mail. See pictures for condition. Tested and working. Pre Owned Replacement Pegs Lite Brite Assosrted years and sizes. See photos. Round pegs. Good Used Condition 1lb 13oz of pegs. These fit in a quart size zip bag. 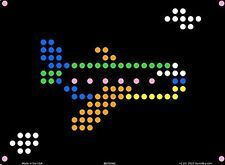 You can create any thing you want with blank lite brite sheets 12 per lot. Vintage 1970’s Original Lite Brite Pegs 1-1/8 Inch, Bag of 100 Mixed Colors. Preowned excellent condition. This is a mixed lot so there will not be the same number of pegs for each color. Lite Brite Cube Lot. Extra pegs and paper. Item is working. Condition is Used. Shipped with USPS Priority Mail. Up for sale is a Lite Brite Cube Screen Only. Create and design exciting pictures on a lite brite cube screen! This cube screen works great! It's in very good used condition. 100 TOTAL CT. LITE BRITE NEW STYLE PEGS. In nice condition - no cracks - works great. There are only 2 black pages (used and wrinkled) Bag of pegs. Box in solid shape - a little dusty from storage. What you see in photos is what you will get. Lite Brite Pegs. These do not work with the older versions of Lite Brite. Copy of instruction booklet, and one new original picture sheet. New batteries and working bulb included. Features peg storage. By Hasbro. Includes (180) original pegs in the following amounts • (20) Clear. Nice & clean. Ready to use. FREE SHIPPING !!! Condition is Used. Most are 1” long. This is due to a number of factors such as; lighting, different monitor resolutions and/or cell phone screen resolutions. See pictures for best idea of condition. These are the original longest pegs, from the 1960's and early 70's. Sold in bags of 100, mixed colors. 1990 LITE BRITE REFILL PEGS NIB. Condition is New. Shipped with USPS First Class Package. LITE BRITE LED FLAT SCREEN~w/ PEGS & Patterns~Light Bright HASBRO~NICE. Condition is Used. Shipped with USPS Priority Mail. Light Brite Cube With Pegs No design Papers 2001 Hasbro. Condition is Used. measures 8.5 x 8.5 x 9” there are two small drawers at the bottom of the cube to store pegs, One drawer on each side. a bag of pegs included. No papers with designs. The lightbulb was tested and works. Not sure how old it is. With shipping, possible that filament may break. I’m going to suggest a new bulb to play safe. Shipped with USPS Priority Mail. These are the round style pegs for the Basic Fun Lite Brite and the Ultimate Classic Lite Brite. Pegs are new - unused. They are sold in bags of 100 - mixed colors. They will work with the Magic Screen Lite Brite, but are not an exact match with the original Magic Screen pegs. Lite Brite Pegs Modern 7/8" - 8 Colors - LOT OF 142 (from a 2003 machine). Condition is Used. Shipped with USPS First Class Package. 150 Lite Brite pegs. Approximately 7/8” long. Mixed lot of assorted colors. Preowned in excellent condition. FREE SHIPPING. They do not fix LITE-BRITE Magic Screen. Lot of 100. Lite Brite Light Bright Replacement PEGS Lot of 350 Assorted Colors 7/8” Long. Condition is Used. Shipped with USPS First Class Package. 200-piece lot of modern, 7/8" Hasbro Lite Brite pegs including a few power pegs (multi-pegs). I personally counted the pegs. I counted each power peg as only 1 peg. LITE BRITE, Hasbro Flat Screen Toy, Purple! Excellent Condition! Lite Brite toys were first introduced by Hasbro in 1967. The Lite Brite unit features a light box full of holes into which colored pegs can be inserted to create a picture, either independently or with the use of an included template design. When the unit is plugged in, the colored pegs are illuminated with a standard light bulb in the back of the unit. Each peg becomes its own tiny light, creating a satisfying glow. 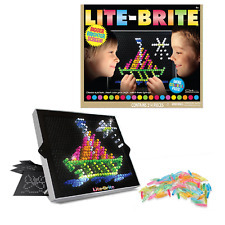 The Lite Brite kit comes with several templates, with additional designs and replacement pegs sold separately. Children can also create their own designs with a plain black piece of paper. The original box for this toy includes the unit itself, several pictures, the light bulb, and a full peg set with eight colors. What peg colors come with the original Lite Brite? The Lite Brite LED Flat Screen: This battery-run version features a lit LED screen and is available in several colors. The Lite Brite FX Flash Art: This version offers an audiovisual experience, including changing colors and strobe light effects. It also plays music and features a spin button that rearranges your design when you press it.